1- Which controllers does this board support? 2- Can't I just buy one of the USB to Game Port cables I keep seeing on Ebay? 3- What operating systems does this board work on? 4- My device is plugged into the game port on my computer. Why doesn't it work? 5- Will my Force Feedback Wheel work? 6- Will force feedback work on my Force Feedback Pro? 7- My board isn't recognized by Windows. 8- I hooked everything up and it all works except the throttle. 9- I have one or 2 buttons that don't work. 10- I plugged in a different model Sidewinder joystick and it doesn't work. 11- My Force Feedback Wheel has no FFB effects. 12- I'm not happy with your adapter. What will you do about it? 13- HOW DO I GET AN ADAPTER? 14- I didn't order a case with my adapter. Can I still get one? 15- Where can I learn more about these adapters? 16- How do I use the option header? 17- Why are only 6 pins on the option header used, and the jumper not used at all? 19- My joystick isn't working right. How can I test it to get a better idea what's going on? 20- Exactly what cable is required to hook my adapter to my computer? 21- Is there any way to use our joysticks as Xbox 360 controllers? Full support for the 3DPro, 3DPro Plus, Precision Pro, Force Feedback Pro, and limited support for the Force Feedback Wheel. The Sidewinder 3D Pro is supported in full digital mode. The converter cables will work for the 3DP in ANALOG mode. The 3DP Plus, PP, FFP, and the FFW are digital only. The game port itself is analog only. You need to have hardware AND software to convert the signal. The converter cables won't work for any of the digital only controllers. The 3DP has 2 analog modes that the simple cable converters will function with. There are two emulation modes, Thrustmaster (looses the slider) and CH (can't have the hat and any other button actuated at the same time). In BOTH modes the hat switch becomes 4-way (vs.8-way) and you lose all the base buttons. It works with Windows XP, Vista, Windows 7, and Windows 8/8.1 in both 32 bit and 64 bit. It has also been tested on Mac OS X and Ubuntu 14.04 so you should be good to go. Keep in mind that the different Linux flavors are compiled for specific purposes sometimes so if the adapter does not work on yours, you most likely need to add support for joysticks. The files to support the adapter are out there and I leave it to you to find them. I'm not a Linux guru. The last MS operating system to have support for the game port was WinXP. Even if you have a sound card with game port or a motherboard with onboard game port, if you are running Vista or above, your computer's game port will not work, so obiously anything plugged into it will also fail to work. There is a FFB Wheel project under way. They have the wheel itself working but the force feedback effects are not working yet. The project is currently stalled but I have hopes that it will continue shortly. There are no gaurantees in an open source project as everything is volunteer, but it's close and either the original programmer or someone else with a wheel will likely step up. Definitely! The FFB will work on the FFP as long as the game and OS you are running support it. There is some FFB support in Linux but I don't think it includes the Microsoft Sidewinder series at this point. Please correct me if I am wrong. All boards are tested before they are shipped. It could be a bad USB cable causing this. One way of getting a better idea what's going on is to plug just the adapter into the computer (no joystick). The LED on the Teensy should be blinking slow and steady to show that it's waiting for a joystick. If it's not, try wiggling the cable and the connectors. If it blinks but not steady, then replace the cable. It likely either has a broken wire inside or a flakey connector. If the light blinks steady and wiggling things doesn't seem to affect it, then try plugging the joystick onto it. I have seen some computers acting a bit finicky about the order things are connected. In all instances, hook power to the joystick first. Hooking the board to the computer and then hooking the joystick to the board seems to be the most reliable when using USB 2.0. If you are running a system with USB 3.0 then try in reverse order. Thanks to Alban Lefebvre for pretty exhaustive testing on his USB 3.0 system. To reset the joystick after a fault, you may need to cycle power to the joystick as well as unplugging and reconnecting the USB. It seems to be able to "remember" a faulty state if power is not removed. If the throttle is the only thing not working, then it is most likely a program issue. On a digital joystick, which the Sidewinders are, all the data shares the same wires. Either it all works or none of it does. With that being said, I have confirmed that the throttle does not work in Microsoft Flight Simulator X with a fresh install. For some reason even though you can fly using the joystick, the throttle is not configured to the joystick by default. You need to go into the setup and configure it manually. Here is a short photographic tutorial to help you fix it. Some other games may be the same and Microsoft games would be highly suspect. The moral is never assume. If only one or 2 things don't work, double check the setup. As stated above, digital joysticks share data wires. If one or two things don't work then it's either game configuration or the joystick itself. These joysticks are 20 years old, and may have been in a closet for the last 10. The rotary switches (throttle...) are pretty much self cleaning if you run them back and forth a few times. The button switches get dirty and just quit working. Pounding on them may get them to make connection but they won't work right till you clean them. If you run a Windows OS, you can verify what's going on by using the joystick control panel. On Win7, click the start button and in the search box type "JOY.CPL" and press the enter key. Your joystick should show up in the window (it's reported differently depending on the firmware you have loaded on the Teensy). 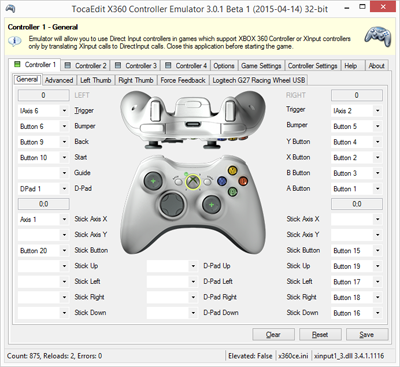 Select the joystick in the window and click properties. You can now test that everything except the force feedback is working properly. Once you confirm which button(s) are not working, write them down so you don't get confused later. Now unplug the joystick from the computer AND the power supply. Open up the joystick base and locate one of the switches that's not working properly. Using either electrical contact cleaner or 90% (or higher) rubbing alcohol, put a few drops on the switch and start working it in and out. You can also work it in a circular motion to get as much rubbing action inside as possible. I like alcohol better since it doesn't evaporate as fast. Do NOT use regular 70% rubbing alcohol as it has too much water content and will cause problems down the road. Take your time and add cleaner as needed to keep the switch wet so the cleaner will work it's way inside. When you think it's done, work it some more to be sure. It's easier to take too much time rather than having to tear it apart and try again later. Repeat with each bad switch. When done cleaning, blow it off as best you can with canned air. Concentrate the air on the switches. Leave it open and let it dry over night to be sure it's dry. Reassemble and test it again. The switches should be working. If not then tear it apart and try again. Clean longer this time. :) If you can't clean them, you have to replace them (or the entire joystick). I revived 3 switches using this method on my own Force Feedback Pro. You're absolutely right. It doesn't. The wheel is under developement and that's where the project stands right now. The firmware is BETA. I hope the project continues to completion but there is no gaurantee. I sold you this adapter "AS-IS" with the understanding that any, all, or none of the firmware may be improved. I just designed the PCB and sling solder for those who can't or choose not to. Just sign up on the waiting list. I'll build your adapter in the order it was received. Sign up HERE. Sure you can IF you have a version 2 adapter. The cases were designed to fit the version 2 board which is much smaller then the version 1 board. The printer who is making these cases for us has an order page on his site. Go HERE to order directly from him. He ships to domestic and international addresses. The option header is used for rudder pedals or other things you might dream up to add. At this point in time only the first 6 pins do anything with the rest being reserved for possible future use. The first 2 pins are power and ground. Pins 3 & 4 are separate axis. Pins 5 & 6 are tied together as a slider such as you'd use for rudder pedals. The enable jumper has no effect right now. The header is always enabled regardless of jumper setting. The jumper was intended to be sure "noise" from the header didn't interfere with any signals to the joystick (you could disable it) but it hasn't proved to be an issue. It may be used for another function at some time. These are what we refer to as "future proofing". They may be used later. The problem we have is that I need to have a design for the adapter in order to have them produced so I can build and sell adapters. The programmer on the other hand keeps dreaming up cool things but then has to figure out how to make them work on the board we have... We basically guess at what we might need or want on the board later. Sometimes what he thought he was going to do doesn't work out and he takes a step back and tries again. Other times what he thought he was going to do doesn't happen at all. He has a cool idea and goes in a completely different direction. 18- How do I reprogram the adapter to use a different joystick? Unplug the joystick from the adapter and then plug the adapter into your computer. You'll find the Teensy loader program at http://www.pjrc.com/teensy/loader.html. Click on the operating system you're using and you'll find both a link to the Teensy loader program and detailed directions to use it. For Force Feedback Pro joysticks with force feedback effects, use the adaptffbjoy-r54.hex file. If you have a Precision Pro, 3D Pro, 3D Pro Plus, or FFP that you don't need FFB effects on then load the 3DPro32u4-10.hex file to switch freely between these sticks. If you have the Force Feedback Wheel, use the beta file Wheel.hex. If you just want a quick & dirty download of the Windows version of the Teensy Loader program. To test your joystick in Windows, when using XP go to the start menu and choose RUN. Type in "JOY.CPL" and hit enter. If using Vista or Win7, click the start button, type "JOY.CPL" in the search box and click it in the list. This is the joystick control panel. It should recognize the joystick and you can check that it is working on your system by clicking the PROPERTIES button. You will need a USB 2.0 A male to mini B male cable of no more than 6 foot length. Please note that I said MINI, not MICRO. Here is a picture to help clarify. A utility has been located that does exactly that! One of my customers has been using it for quite some time now and is very satisfied with the results. According to him, setup can be a bit tricky but not terribly bad.